Enjoy the best of Cesenatico and its surroundings as a couple or a family. Would you like to enjoy a relaxing holiday in the sun and the nightlife in one of the liveliest places on the Romagna Riviera, and take your family to visit the splendid Cesenatico surroundings? 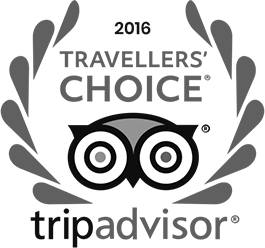 Hotel Giamaika is the place for you thanks to its privileged location, which makes it ideal to visit with ease all the nearby places that are not to be missed. Not only is the hotel just 80 m from the beach, it is also ideal for trips to the Cesenatico countryside. Here you can enjoy the more relaxing side of the seaside resort and discover what the splendid Romagna land has to offer with its planes, hills and towns, and small unique hamlets that will enrich your holiday. 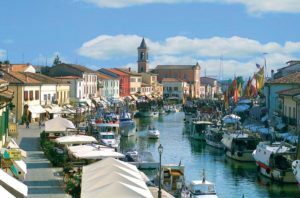 Cesenatico is the centre of the tourist scene in Emilia Romagna, where fishing and tourism, tradition and modern wellness blend in a veritable exchange between the past and the future. It is synonymous with holidays, especially family holidays, considering the warm welcome we show couples with children, which is renowned throughout Italy. But Cesenatico is also the ideal tourist destination for young people as it is very close to the many renowned beaches and discotheques of the Romagna Riviera. The soul of town life is still to be found along the channel harbour, where the fishing boats are moored and the many restaurants that are renowned for their maritime cuisine stand. The most famous museum of the town is the Maritime Museum, an exclusive floating museum that is unique in Italy. It is located in the oldest and most typical part of the Cesenatico channel harbour and is the perfect summary of centuries of maritime history that comprise big and small events linked to life by the sea, to the fishermen and to commerce. The maritime Museum, in an original way, exhibits boats that are moored in the channel harbour, which you can board. For sports and cycling enthusiasts the Spazio Pantani area is a must. It is dedicated to the famous cyclist, whose life was linked to Cesenatico. Going on an excursion in the Cesenatico countryside means exploring suggestive corners of paradise that will enrich your holiday. From the sea to the hills, from the routes to cycle along to the nearby hamlets and towns, you will always find suggestive landscapes to admire. The countryside offers towns of great artistic and cultural interest such as Ravenna, San Leo, the Republic of San Marino, Cesena, Santarcangelo, Bertinoro and many more besides. This is what you can do, and the distances of each destination that we recommend. Santarcangelo is a special town because of its dual soul which is popular and noble at the same time, for its traditions that have been kept alive, its monuments, mysterious caves, extraordinary artisans, exhibitions, the temptations of its excellent cuisine, and the people who tell stories while sitting in the shade of the ancient streets. 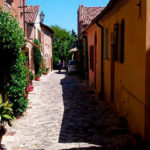 Santarcangelo is near the sea and offers an atmosphere that is unique of its kind. The Republic of San Marino, a veritable state within the Italian borders, is so renowned it doesn’t need a long presentation. According to tradition, it was founded in 301 A.D. by the Saint it is named after. 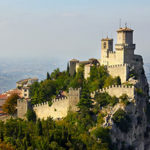 San Marino is a very popular destination where tourists like to stroll through the narrow streets, which are full of typical shops, and admire the landscapes. A sharp rock with sheer sides that stands in a setting that stretches from the Apennines to the sea; a gathering of old houses around a superb fortress and a splendid bell tower; a weaving of history and legend, of the sacred and the profane with its terrible prisons and quiet churches: San Leo is all this and more besides. Conserva in splendidi monumenti la testimonianza del suo ruolo di grande polo politico, commerciale e artistico nel susseguirsi di civiltà diverse. In It harbours splendid monuments that are a testament to the great political, commercial and artistic role it once had during the course of various civilizations. 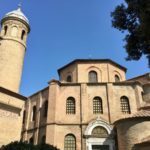 In particular the Roman Imperial period and the splendid time when Ravenna became the centre of the Eastern Empire have left an extraordinary complex of basilicas, baptisteries and mausoleums in the city. 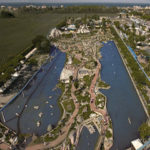 The trips in the Cesenatico surroundings include a must, the Theme parks, which are renowned throughout Europe. 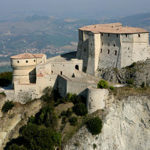 The Romagna Riviera is in fact known as the “Theme Park Riviera” as it offers a host of unique experiences! Beautiful aquariums, fantastic dolphinariums, fun water parks, and exciting theme parks for adults and children alike. Immerse yourself in the most spectacular and enveloping atmosphere of the Romagna Riviera by visiting these places. Mirabilandia is the biggest Theme Park in Romagna and one of the most important in Italy and Europe. The Park comprises various areas including Bimbopoli, which is of great interest. There are 40 attractions for everyone, and throughout the day shows take place in a setting of greenery and water (3 lakes, 7 fountains, and 14 waterfalls). Enjoy a unique experience exploring the cultural heritage of Italy and Europe with 270 perfect scale replicas of monuments and architectural works of art. Experience the pleasure of learning and discovering thanks to an unusual blend of attractions and games: this is Italia in Miniatura. One of the most important theme parks on the Adriatic Coast that is visited each year by tourists from all over Italy and Europe. The giant whale on a scale of 1:1 is the symbol of Atlantica. It is situated at the entrance to the park and is a fantastic attraction for children who float through its tummy on colourful rafts. 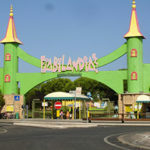 The surface area of Fiabilandia is 120.000 square metres and it hosts various attractions. There is also a special structure where, every year, various exhibitions are set up on different themes that are usually educational: underwater life, educational games, the origins and history of scary stories, recycling and more besides. The sun and the beach, relaxing by the pool or wonderful trips by bike, car or public transport. Get ready for an unforgettable holiday in Cesenatico when you book at Hotel Giamaika!